Cadillac Self-Driving Cars: Out By 2015? Google has been getting all of the attention when it comes to self-driving cars, but such technology still seems to be a ways off from hitting the market. The first publicly-available "self-driving" car could come from Cadillac, who is showing off self-driving technology of its own. Cadillac expects to include a "Super Cruise" function in its commercial automobiles as early as 2015, General Motors announced Friday. 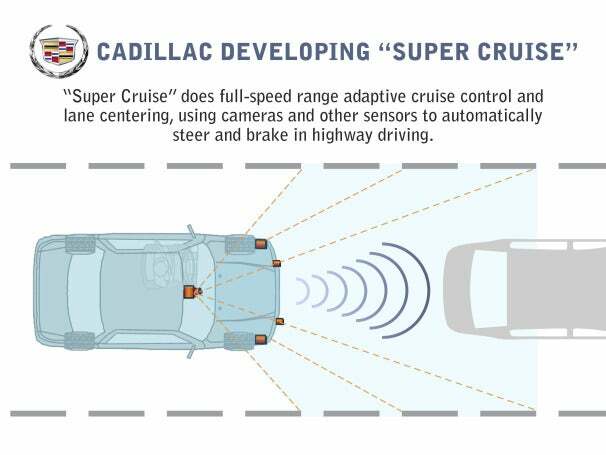 A vehicle equipped with Super Cruise will be able to automatically steer, brake, and center itself in a lane during "optimal" highway driving conditions. It's not quite the same as the completely self-driven car Google is going for, but it is closer to being publicly available. Current Cadillac models already include the building blocks for the Super Cruise function, and are able to automatically brake and adjust cruising speeds based on other vehicles nearby. Super Cruise will only work in perfect weather conditions, though. According to Cadillac, certain weather conditions that hide lane markings or cause issues with GPS will force the driver to grab the wheel. So you can't doze off while in Super Cruise -- not yet, anyway. According to GM, the goal of Super Cruise is not to give customers a personal chauffeur. "The primary goal of GM's autonomous and semi-autonomous vehicle development is safety," GM Director of Global Active Safety Electronics and Innovation John Capp said in a statement. "In the coming years, autonomous driving systems paired with advanced safety systems could help eliminate the crash altogether by interceding on behalf of drivers before they're even aware of a hazardous situation." The goal of Google's self-driving car project, on the other hand, is to give customers a personal chauffeur, and Google's robotic cars have already logged a reported 140,000 self-driven miles. Google's cars aren't quite ready for primetime, though, and one of its cars was even involved in a minor fender-bender last August (Google claims the crash occurred while the car was in manual mode, but has not yet released the full details of the accident).